I first heard about this brand in the late summer of 2013 via Facebook, and read an article about a guy in Tennessee who was importing a new brand of tequila and marketing it with the slogan "The True Taste of Tequila", so a couple of things peaked my interest. First, how could it take almost a year for me to even have heard of this new brand (that article was written in November of 2012), and to say Trianon is the "True Taste of Tequila", is a very bold statement to make. So I did a bit of research and found out that the brand is made at Tequilas Las Juantas NOM 1500. While I have only tasted one other brand that is produced at this distillery, I have heard really good things about this production facility. Also, since Trianon has a nice hand-crafted three-pack set that stacks on top of each other, it is a pretty memorable brand. 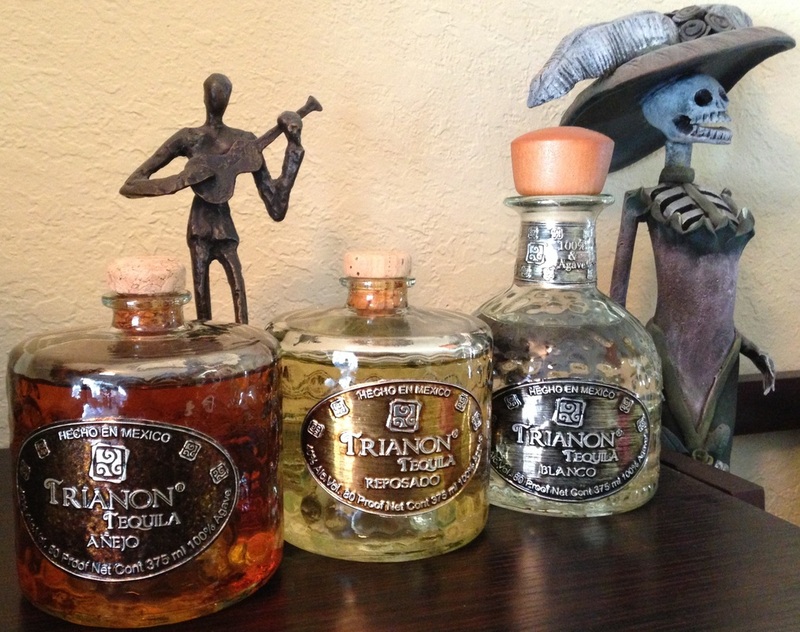 Fast forward a few months, I received an email from someone asking if I'd be interested in reviewing Trianon Tequila. Well, of course I would, and here are my thoughts. After pouring this tequila, my glass is about 3 feet away from me, and there is a nice scent of something sweet, crisp, and green coming from the glass. It reminds me of a baked apple - and my mouth starts to water. Wow, this blanco has a lot of beautiful aromas from caramel (from the cooked agave), fruit, spice, and a touch of pungent earth - everything that a “true tequila” should have. I’m a "finish" guy (as I say, "The Truth is in the Finish"), but man, I could just smell this tequila for hours!! I do hope that the finish delivers what the aroma promises - Big, Bold, & Complex. Yeah, the taste is there - I dig it! It starts off sweet and spicy, then leads to a wintery-spearmint finish. The ride on the finish is nice, of medim-long duration, and somewhat complex - it really tells me everything from the agave to the production process. And what it tells me, is that this is a “traditional tequila” from Amatitan. I’d love to taste this at still strength (55%+ alcohol), and unfiltered, to really dig into the earthy soul of this tequila!! Herbal, citrus, floral, and pineapple aromas are the notes that I notice. From the light-buttery appearance, and that the nose seems soft, yet does not have a lot of heavy oak notes, I’d bet that these barrels have seen a few fills in their day. And there is nothing wrong with that. A lot of producers prefer old barrels for tequila as it helps to balance to wood and the agave. This repo is a great example of finding that balance. With my first sip, my palate is blindsided by the amount, and intensity of spice in this tequila. It is shortly followed by the earthy core of the agave. Going back to the nose, all the spices are laughing at me for not noticing them the first time, as they are very predominate now! While not as complex as the blanco, the finish may be a bit longer. Once again, this is a nice example of a traditional tequila, yet soft and "sophisticated". An easy sipper, yet would make some great cocktails - inside, and outside of the margarita box. Copper-red to the eye, one would think that this was aged for a really long time. But the color of a spirit can also come from a freshly charred barrel, or caramel coloring, as well as the time spent in the barrel. Since the Trianon blanco and repo are 100% legit, I’d bet that this was aged in freshly toasted barrels with a heavy char. On the nose, there’s lots and lots of caramel - both from the cooked agave AND the the barrels from which it was aged! In addition, there are some nice earth and spice tones, as well as a bit of leather, tobacco, musk and cooked fruit. Soft on the palate, and very easy to drink the taste starts with candied fruit, then turns earthy, then spicy, with a wintery-mint finish that is similar to the blanco, though softer than the repo, and shorter than the blanco. Super easy to drink, and would make some delicious Old Fashioned cocktails!! Over all, this is a good brand that delivers on their slogan. Go grab yourself a bottle, or ask your local bartender for a taste, I'm sure you will dig it!